The teacher that stayed after class to help you with your assignment, the parent that supported you every step of the way, and the class that inspired your career choice all had a vital part to play in your college preparation. College is a choice that impacts your entire future. Preparing for college should begin during the first year of high school. For most students, college is a 4-year minimum commitment that includes: financial responsibility, academic focus, part-time working, and having little to no social life. Don’t sweat it! We are going to look at a few strategies that help students prepare for college. It’s never too soon to think about the rest of your life. Studies predict that the average person will have 5+ careers in his or her lifetime. When thinking about college you only have one major field of study. NYC private tutors suggest doing general coursework while choosing a major. By doing the basic coursework first it buys you a little more time to make a final decision on a major if you are undecided. There’s no point in wasting time and money when you are not certain of your field. Narrow your possible options to a few areas of interest during high school as much as possible. It’s not a bad idea to start looking locally. If you have a tight budget living with your parents isn’t exactly the college dream life, but it allows you to work part-time while doing general coursework. When you start looking for a college early it allows you time to prepare for admissions, ask questions, and prepare financially. Good grades during high school definitely helps open your choices for college, but know what requirements the college needs to get you admitted. You can set goals for yourself when you know more up front about GPA and expense. If you’re athletic there are many scholarships available that can get you into some of the nation’s top colleges. Schedule times to visit the campus and talk with admissions. If you are on top of your game and know a field of study, email professors in the department you are interested in applying. It’s no secret that even local colleges are expensive. For the past 10 years the price per credit hour has been at a steady incline. The U.S. Department of Education provides a federal student aid program known as, FAFSA. This is a loan program that can be opened by students in America looking for a chance at higher education. The office of Federal Student Aid offers more than $150 billion every year to help around 13 million students paying tuition for higher education. This does not include private loans that are opened through banks and other lenders. It’s important to know the financial responsibility of college before starting school. College degrees are necessary for many higher paying jobs in America and earning your degree can be worth the investment. Be smart about the money you borrow and you should be fine. Applying for scholarships is a great first step in looking for colleges because no matter what school you choose you need to pay for it. Many high school counselors can assist with available scholarships. It doesn’t hurt to apply; even if you don’t get the scholarship it was great practice. Keeping you GPA up during school shows academic responsibility. Teachers reward successful students by offering to write letters of recommendation. Building rapport with classmates that have similar goals will help keep you focused on your future. Most colleges require that you take some entrance tests. 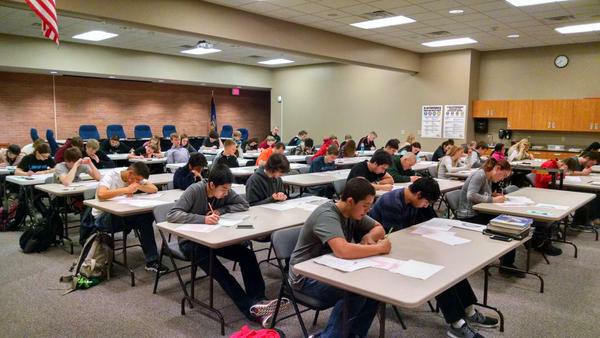 This could be ACT/ SAT or even a placement exams. If you are good at subjects like math or English it’s not a bad idea to try testing out of those general coursework classes. Testing out of classes not only saves you time and money, but it might open the door to more challenging classes.